Defense Minister releases special message promoting haredi enlistment on the occasion of the Purim holiday. 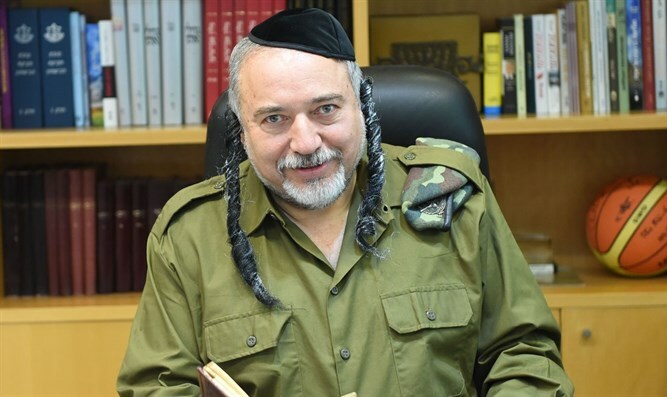 Defense Minister Avigdor Liberman promoted haredi enlistment in the Israel Defense Forces in a lighthearted way on the occasion of the festive Purim holiday. Dressed in an IDF uniform, black kippa (skullcap) and peyot (sidelocks), Liberman played on the Talmudic phrase "When the month of Adar enters, we increase in joy," instead proclaiming, "When the month of Adar enters, we enlist with joy." In the same Purim spirit, the Defense Minister nominated haredi Deputy Health Minister Yaakov Litzman for the Sayeret Matkal elite army commando unit and Knesset Finance Committee Chairman Moshe Gafni for the Shayetet 13 naval commando unit.